Doc Searls Weblog · It’s 2013. Why are we still in login hell? It’s 2013. Why are we still in login hell? I think, wtf is that error doing over on the social side of this thing? Can’t think of an answer, so I click on “Forgot UserID/Password” enter my email address twice, as it requires, and get promised an email that will recall my login details. Click on “more” and I get the less thing again. Anyway, a dead end. 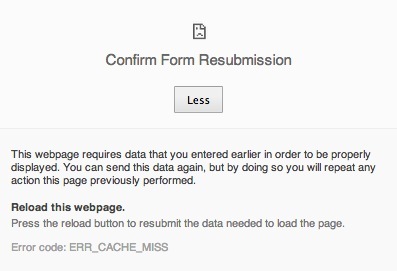 So now I go back to https://adage.com/register, and start entering the fields again. This time I get a red pop-out balloon that says “This address is already taken. Forgot your password?” So I click on the link and get to a window where I have to enter my email address again. I do that and it tells me “Your password has been sent to your e-mail address”. It’s now 10:22. I first saved a draft of this post at 9:07. I’ve been doing other things (e.g. making breakfast and coffee), but you can see this is taking awhile. Okay, so now I have the email, which tells me my password. It’s one I don’t recognize at all. I’m guessing it’s a new one. So I go back to a login page, enter my email address and the password they gave me and: voila! I’m logged in. It is now 10:29. And now, at 10:36, I’ve finished putting up my comment, which I’ve expanded into this post at Customer Commons. Meanwhile, back to the title of this one. Why are we still in login hell? The sites are the servers, and our browsers are the clients, suckling the servers’ teats for the milk of “content” and cookies to keep track of us. It has blown for eighteen years. Different kluges with every single website and Web service, each a silo. All of those silos think they get “scale” with their thousands or millions of users and customers. But you get the opposite, and it only gets worse with every site you add to your roster of logins and passwords. Huge burdens on servers and personnel who need to create and manage easily-broken systems such as AdAge’s. We can only fix this thing from the client side. It’s simple as that. We’re the ones that need scale. We’re the ones that need our own simple and singular ways of relating to others on the Web and the Net. Hint: we won’t be able to do it through any silo’d service. We can prototype with those, but they are not the full answer. They just answer the silo problem with yet another silo. 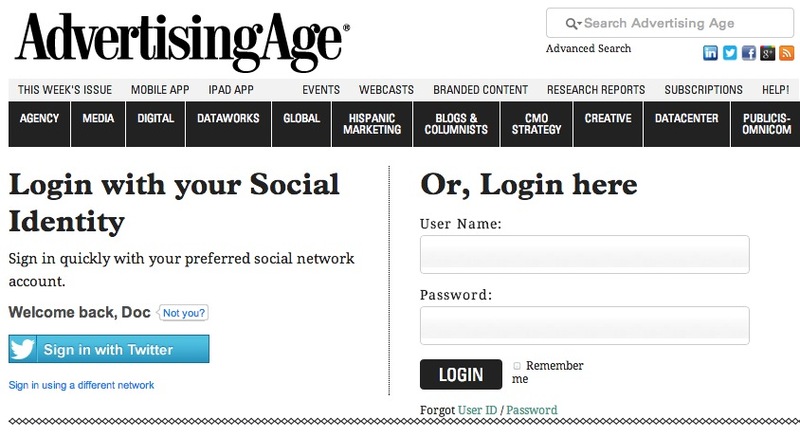 But, hey: if we’re leaving the corral,why should we need logins and passwords at all? If you and a site or service truly know each other, why should you both go through the rigamarole of logging in all the time? There are a zillion good security answers to that question, but they are all coming from inside the same box (or corral) we’ve been in for the duration. It’s time to think and work outside that box. Mozilla Persona is full of win. So you can use your @example.com email addres to log in to whatever sites you like, and example.com never knows which ones. If your site login method is based on “let’s make users remember complex strings of text, which we know people are really bad at” or “let’s depend on having our users tracked by big companies, which we know people hate” you need a hacking break–make a simple web application that uses Mozilla Persona, learn how awesome it is, and never go back. Same thing happened to me with emmbedded.com, except the password reminder email never arrived. Twice. I know folks at embedded, so I sent a request to have my password reset. Got a prompt reply, but nothing happened. Next day repeated request. Finally able to login. 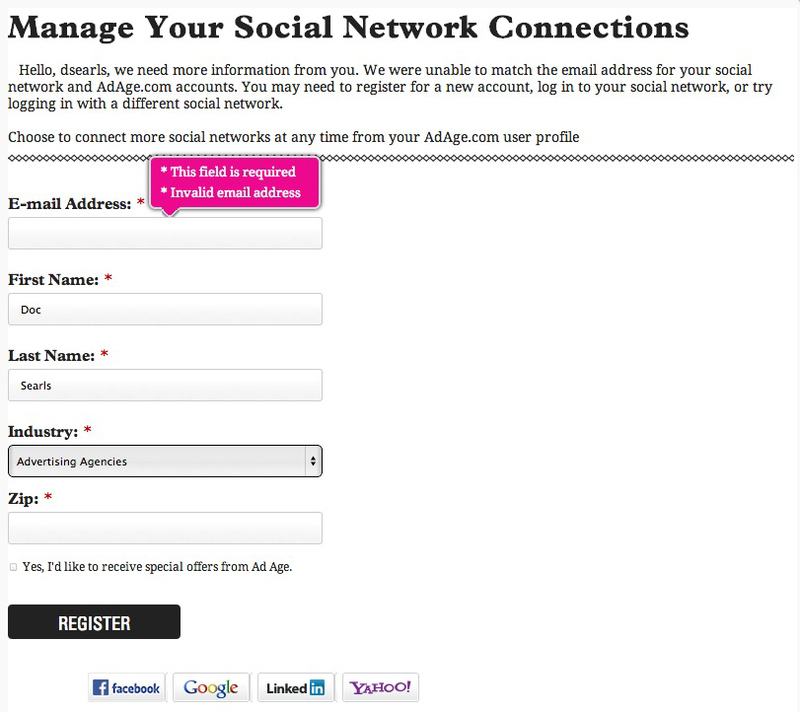 Seems everyone thinks this social sign on is a good idea, but I’m not seeing it work anywhere. The pic of those cows looks fantastic and the edited part of the pic is correctly matched to the content of the blog! This is unconscionable, and a waste of time. We are channeled into this narrowing alleyway of noisy vendors hawking their wares. No escape. Like the ebooks at the public library, that can only be checked out to one person at a time. Even the free books, to even find them is a daunting prospect. Use Linux, and you pay the time tax even more painfully. I just had a conversation this week about libraries with an elder scholar, who bemoans the death of academic libraries. She was frustrated in her efforts to download an academic paper to her ebook—even though, for sure, she had all the right connections and passwords. Try government websites. The government has been purchased by the Proprietary $OFTware industry. Pervading every corner of our world. You have provided an awesome example. I don’t get this far in the conversation with the server. I have a low pain tolerance..